This week at the 2016 North American International Auto Show we finally got a chance to see BMW’s newest sports coupe in the flesh. With reduced dimensions and a smaller price tag than that of its bigger brother, the M4, could the M division’s latest offering be the performance model we’ve been waiting for? It seems like every time BMW launches a new performance coupe they’re quick to recall their past triumphs with models like the 2002 Turbo and the first generation E30 M3. And why not? While their power delivery might have been modest compared to today’s standards, these are the cars that put BMW on the performance map with their lightweight design and well executed chassis and suspension tuning. But in recent years, as the luxury options in BMW’s performance offerings has swelled, so has the weight. In turn, some of the nimble, tossable character that BMW M cars of yore were known for has become a by-gone era. But BMW looks to be changing that perception with the all-new M2 model. Taking the brand’s smallest coupe currently on offer and injecting it with some performance enhancements isn’t exactly new territory for BMW, even in recent memory. In 2014 they introduced the M235i, a beef-up version of the diminutive 228i coupe that offered a healthy dose of performance, but didn’t get the full treatment of M goodies like the venerable 1M did before it. Though they don’t share their Series designations – BMW’s naming conventions have gotten more convoluted than their electrical systems in recent years – it’s fair to consider the M2 as a direct successor to the 1M. And like the 1M, the M2 takes a fair share of its go-fast parts from its larger BMW performance coupe counterpart, the M4, much the way the 1M pilfered the last-generation M3 parts bin. Powering the new M2 is a bi-turbocharged 3.0 inline six cylinder motor developing 365 horsepower and 343 pound-feet of torque, gains of 45 hp and 13 lb-ft over the M235i but still 60 horsepower shy of the current M3/M4, though the motors share a number of identical components, including the pistons and crank bearings. 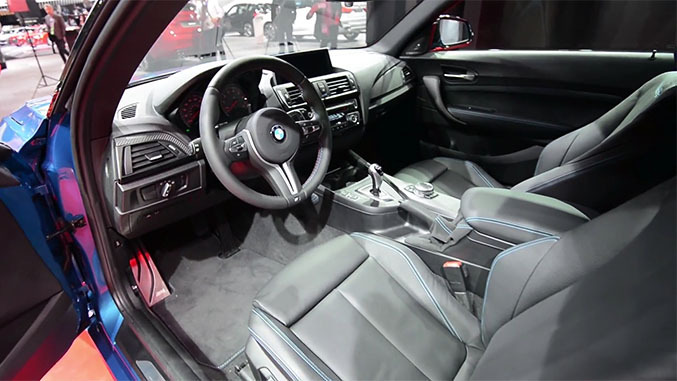 Customers will have the option to either row their own gears through a six-speed manual gearbox or swap cogs through a seven speed dual clutch unit, also poached from the M3/M4 cars. 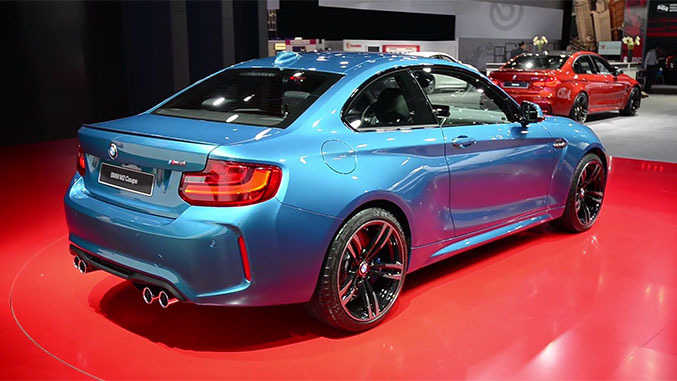 And the M2 certainly looks the business as well, with bulged and chiseled bodywork that’s designed to accommodate a widened track that swells out 3.1 inches in the rear and 2.1 inches up front in order to make room for the wider 19-inch forged wheels, which are wrapped in Michelin Pilot Super Sport tires. With all of these go-fast ingredients packaged in a substantially smaller car than the M4, the M2 looks to be genuinely recapturing some of that 2002 Turbo / E30 M3 charm that BMW is so eager to reclaim. But it turns out that despite their efforts, BMW was only able to shave 85 pounds off the manual-equipped M2 versus the M235i, as it weighs in at 3450 pounds. That means that despite being substantially smaller dimensionally, the car is actually no lighter than a similarly equipped M4. Yeah, we’re scratching our heads at that one too. But the M2 will command a price tag that’s also significantly lower than the M4’s, starting at $51,700 (versus $64,200 for a base M4). And with a reported 0-60 sprint of 4.2 seconds, the M2 certainly won’t be slow. Still, we can’t help but hope that an M2 GTS is already in the works.